The definition of risk is often described in terms of chance or probability. In the world of avalanche forecasts, avalanche hazard has often been hamstrung by this definition. An example of this problem is often seen during periods of deep slab or persistent problems, when the low likelihood of a major event--despite the severe consequences of such an event--warrants merely a moderate hazard rating. A fatal example of this occurred on December 26, 2013, when a rider triggered a deep slab on Jackson Hole's "Pucker Face" that subsequently killed him. 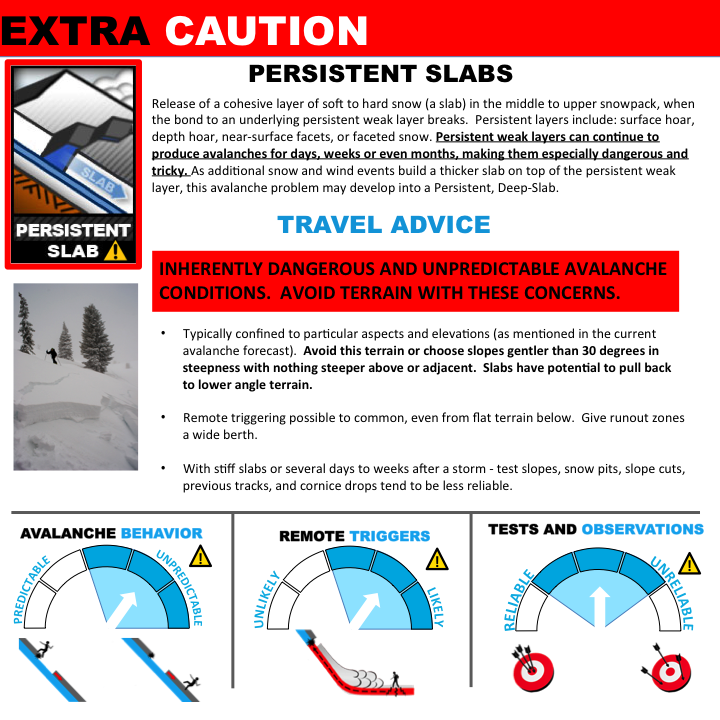 In 2005-06, building on Roger Atkins 2004 ISSW paper, the Utah Avalanche Center pioneered incorporating "Avalanche Problems" into their avalanche advisories. This system has since been widely adopted throughout North America. The UAC's platform can be found HERE. We blogged about the use of this format in Canada HERE. An example from the Crested Butte Avalanche Center can be found HERE. Taking this one step further--essentially combining likelihood and consequence to say, "so what?" -- Drew Hardesty and the forecasters at the Utah Avalanche Center have developed an additional component in their daily forecasts. In this new platform, the given hazard rating will be accompanied with a Travel Precaution Advisory. The new format offers valuable advice for backcountry travelers. With this platform the UAC has a method to communicate the unpredictability, sensitivity, and reliability of stability tests. Now, on a day when a deep slab is unlikely to be triggered, the UAC can still communicate the severity of the problem, despite giving the situation a relatively low hazard rating. Hats off to the UAC for continuing to expand on their tools to communicate the true nature of the problem, rather than simply relying on one word catch phrases which, while accurate according to their narrow definitions, have the potential to mislead backcountry travelers as to the severity of the situation.